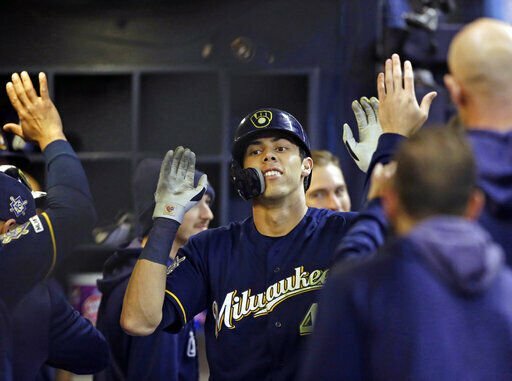 Brewers' Christian Yelich watches his solo home run in the eighth inning against the Cardinals on Monday night at Miller Park. Yelich finished 3-for-4 with seven RBIs. Seven of his eight homers this season have come against St. Louis. Mike Moustakas is all smiles after his solo home run in the second inning cut the Brewers' deficit to 2-1. MILWAUKEE — Brewers outfielder Christian Yelich spent an hour hitting baseballs with hitting coach Andy Haines prior to Monday night’s game. The extra batting practice certainly paid off. Ryan Braun was out of the starting lineup for a second straight game, but Brewers manager Craig Counsell said there was no cause for concern. Braun didn’t play Sunday in Los Angeles because his balky back was acting up. As for Monday, it was a matchup decision — left-handed hitters entered the day with a 1.405 OPS this season against Hudson. 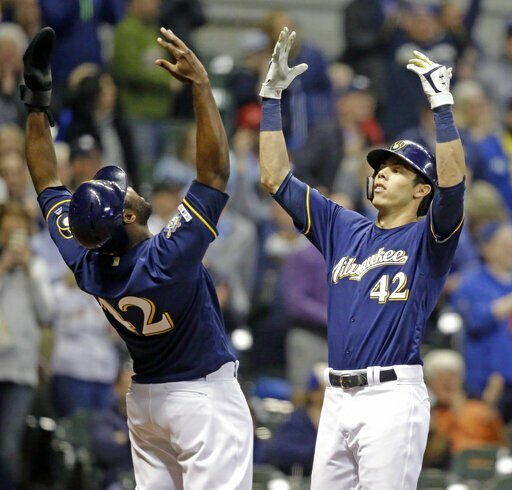 Braun struck out as a pinch hitter in the seventh inning. Right-hander Jimmy Nelson (shoulder) pitched four simulated innings in Arizona on Monday and it “went well,” according to Counsell. Nelson will pitch one more controlled game in Phoenix before the Brewers consider whether to assign him to a minor league affiliate, most likely Class AAA San Antonio. Meanwhile, right-handed reliever Jeremy Jeffress, who began the season on the injured list with a sore right shoulder, is scheduled to be activated Tuesday. On Tuesday, St. Louis right-hander Jack Flaherty (1-0, 2.93 ERA) looks to build on consecutive solid starts, having allowed one run in 11 innings in his previous two outings. He will face right-hander Brandon Woodruff (1-1, 6.00), who makes his fourth start and second against the Cardinals. Milwaukee goes 2-4 on the six-game swing in California.